As said above, I almost only ever listen to playlists on my phone so I am not sure if it is restricted to this case. When listening to a playlist on shuffle, about every three to four presses of "Next"/"Skip" (it is not consistent) MMA will fade transition the song info display into a song that was previously playing despite a new song actually being played. For example, I might be on some arbitrary song I will refer to as "Song1" and decide I don't feel like listening to it at the moment so I hit next a few times until I find a song I feel like hearing: Song1 is playing and Song1 info is shown, (HIT NEXT), Song2 is playing and Song2 info is shown, (HIT NEXT), Song3 is playing and Song3 info is shown, (HIT NEXT), Song4 is playing BUT Song2 info is shown. It will show ALL of the info for the other song (artwork, artist, title, etc.) as if that song was actually playing, but a new song is indeed playing. I have not had a chance to test and see if it only happens when I press "Next" quickly after the song starts or if it can happen no matter when I hit "Next" during the song duration. It almost always stays showing the wrong info until the song is over and it auto-shuffles to the next track, but I have seen it correct itself after a couple seconds a small few of times. This behavior does not seem to ever occur when MMA auto-shuffles at the end of a track, only when I manually skip. I am not sure if this is database corruption or a bug but it seemed to have come out of nowhere so I believe it is a bug. There was one time when I was trying to update the library on my phone from my PC that I accidentally started syncing from my desktop instead of my laptop. My desktop has the same library as my laptop but its a more dated version so it did mess up the library on my phone a bit by having some duplicate playlists but that was about it. I simply deleted them. If you guys think it isn't a bug and possibly due to that error I made in syncing above then I will try deleting my whole library on my phone and resync from my PC but that takes a very long time so I am holding off for now. FYI This is among the problem's I've been having with playback. You're not alone. frankz wrote: FYI This is among the problem's I've been having with playback. You're not alone. Thank you for the plus one then. Wish us luck haha. 1) Does the problem of the wrong metadata displaying occur if shuffle isn't enabled? 2) Is the wrong metadata displaying in the Now Playing Art View (i.e. the view in which a single track displays and the Album Art is in the background, filling up much of the screen)? 3) Does the problem occur only when Player > Crossfading is enabled ? 4) Is the problem specific to certain file types (e.g. m4a or flac )? I will test these cases ASAP and get back to you. I can answer #2 - yes. Also in the "Notification" area and also on a Chromecast (I only Cast for playback). Also, related to #4, all my files are mp3. I've sent logs on this (BEV4TDQQFH) related to my previous report (http://www.mediamonkey.com/forum/viewto ... 21&t=87639). 1) I skipped through tracks for about 2 minutes and the problem does NOT seem to occur when shuffle is disabled. 2) Yes. That was what I was referring to when I mentioned the meta data earlier. I actually wasn't sure if it showed the wrong song in the list view when you're browsing a category or playlist that the songs in. After shuffling for a while again it DOES seem to show the CORRECT song in list view, where the album art and limited meta data are at the bottom of the screen and there is only a play/pause and skip button. It also seems to show the now playing arrow over the correct song in the list but I didn't check that much because all my lists are huge. For me at least it seems that the pull down notification is COREECT even while the now playing screen is NOT. I took a screenshot, though this is only one instance. It possible the pull down is wrong sometimes too like Frankz said. 3) I didn't even realize that MMA had crossfaded, my "audio transitions" is set to gapless, which I believe is the default. 4) I have a mix of FLAC and mp3. When I click properties to check the file type it actually shows the correct meta data despite the now playing view remaining wrong. It seems to only happen when the actual song playing is a FLAC file, but 85% of my library is FLAC so I'm not 100% positive. Also some additional notes. 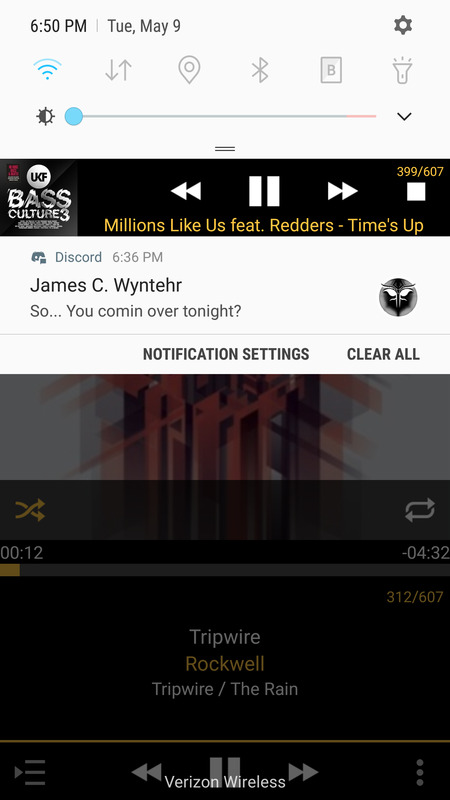 There usually seems to be a couple seconds of lag before the song starts playing when the bug occurs where it will sit a 0:00 (but not always), and sometimes the track bar will be moving as is the song started playing but I hear nothing. If I am really just flying through tracks this lag can become pretty bad and occasionally the song seems like it won't start and I just have to hit next (but again this is only if im rapidly switching tracks which is ver uncommon in normal use). Sometimes when the bug occurs the meta data in now playing will switch when I hit next, but the previous song will continue playing uninteruped unlike the usual where it does switch songs but shows the wrong metadata. All of my library is on my external SD card so it almost seems like it's some desync issue caused by inconsistent access times that was perhaps due tp a change inteoduxed in Nougat or something like that because that update was somewhat recent for the S7 edge. It would make sense since I have mostly FLAC (though i remember reading that decoding them during playback isnt that much more CPU intensive) files but Frankz's library is all mp3. Though I figure it could still make sense because I'd imagine the now playing view is a bit more costly for Android to render which would explain why the other views seem to not experience this bug (for me at least). Anyway sorry for the rambling, good luck and thanks again. I can't replicate on any of my devices. May I suggest that when you see the bug go to ... -> About MediaMonkey and send Log file while writing down log ID here so that we can easily find it for analyze? Peke wrote: Noted for analyze. I shuffled for a bit and sent a log. In this instance the wrong track information in the now playing view was the same previous song's metadata every time (I believe). This and many more improvements are made in MMA 1.3.1.700 Beta that should be available very soon. Can you confirm that the fix in the latest beta works for you? So, the bug seems to be fixed, but there is a smaller new problem now that seems like it might be related. It will still once in a while show the incorrect information on the initial fade translation of the meta data but it will always correct itself before the song actually starts; however, this only seems to happen when skipping tracks really quickly so it's not a huge deal. The slightly more annoying issue is that if I skip somewhat quickly (2 to 3 songs a second), though it might also happen otherwise (I'm not sure yet and will keep an eye out), sometimes it will "shuffle" Into a song that's already been played during that shuffle session. I don't have repeat on and never left now playing or restarted the session in anyway. Visually it happens the same way the old bug did where metadata for a song previously played shows up on a skip, but this time it actually starts playing that songs audio again. I can make a video of this if needed.